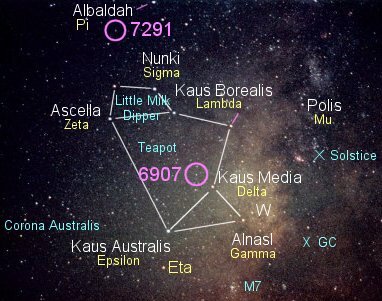 The circle shows the location of the class F star HR 6907, found in the constellation Sagittarius. The star is orbited by two planets, a smaller one closer to the star and a larger one farther away that make it look vaguely like our own system (though both are considerably more massive than Jupiter). *Planet 1: From the star outward, planet 1 orbits in 225.62 days, has a mass at least 2.88 times that of Jupiter, and is 0.81 Astronomical Units (AU) from the star (121 million kilometers, 75 million miles), that is, 81 percent the size of Earth's orbit. Orbital eccentricity takes the planet from 1.06 to 0.56 AU and back again. *Planet 2 takes 5.76 years to orbit. It has a mass at least 4.04 times that of Jupiter, and averages 3.60 Astronomical Units from the star (540 million kilometers, 335 million miles, or 69 percent the size of Jupiter's orbit). The orbital eccentricity is oddly almost the same as that of planet 1's orbit, planet 2 ranging between 2.4 and 4.8 AU. HR 6907, also called HD 169830, is a sixth magnitude (5.91) class F9 dwarf star in Sagittarius. Too faint to have a proper or Greek letter name, it is known best by its numbers in the Bright Star(HR) and the Henry Draper (HD) Catalogues. From a distance of 118 light years, it shines with a luminosity 4.6 times that of the Sun from a surface with a temperature of 6300 Kelvin, over 500 degrees hotter than the Sun. From these values, we infer a radius 1.8 times solar and a mass 1.4 solar and that the star has reached middle age. Like the majority of planet-holding stars, HR 6907 is metal-rich, with an iron content (relative to hydrogen) that is 60 percent greater than the Sun. HR 7291 Sagittarii, at upper left, also has a planet.